﻿ Cristiano Ronaldo: "May the fans score the 1st goal against Bayern Munich"
23.04.2012 » Cristiano Ronaldo: "May the fans score the 1st goal against Bayern"
Real Madrid faces Bayern Munich this Wednesday night and Cristiano Ronaldo pointed out how important it will be that the Santiago Bernabéu fans show that they are behind the team throughout the entire game. The Portuguese player launched an appeal for all the Madridismo to support Real Madrid and help the team scoring the important opener against Bayern Munich. The Clasico was already put behind the news and the next challenge goes by the name of Bayern Munich. Real Madrid was defeated by 1-2 in Germany last week, in a game where the Bavarian side proved the world that they are strong enough to put the Merengues against the ropes. Cristiano Ronaldo talked with bwin.com and despite showing a big respect for Bayern Munich, he also asked for all the Madridismo to relentlessly cheer for the team on this Wednesday's game, so that the given support may turn out to be crucial in intimidating the German side and helping Real Madrid to score the first goal of the clash. Cristiano Ronaldo: "I hope that the Bernabéu score the first goal. Our supporters must play a very important role this Wednesday, right from the start of the game until it's over. All the players feel really motivated when we know the fans are behind us. If we manage to remain together throughout the game, things will certain go our way. It will be a decisive match and having the crowd cheering for us will have a really big impact and effect on the players, simply because we'll be more confident about our chances of beating Bayern Munich", remarked the Portuguese player, who just comes from scoring the winning goal in the Camp Nou, against Barcelona. No one expects an easy task against Bayern Munich and much less Cristiano Ronaldo. The Portuguese player praised the German side and believes that it will be a very difficult game. Ronaldo: "It's going to be a war right until the end. There will be a lot of adrenaline in the air and it will surely be a game that we'll upon with high hopes of winning. Bayern Munich is also a great team and everyone knows they'll present us a very big challenge. We lost 2-1 in Germany, but now we'll be playing at home and it's a crucial game for us. We know that if we win, we'll be in the final! ", noted CR7, aware that a 1-0 result will suffice for Real Madrid to get through to the UEFA Champions League final. Cristiano Ronaldo: "What happened in Germany wasn't neither bad nor good. We're in a good form and I'm confident that since we'll be playing at home, we'll be able to pull of a different result. I'm counting with the help of our supporters, because the game will be very hard, but we must believe we can beat Bayern Munich. They won their game at home, but it's true that we did score a goal there, which can also be important at the end of the day. After the result Bayern obtained in Munich, we're aware that now they'll be playing against us relying on their counter-attack. This shows their respect for our team's strenghts and how cautious they will be with how they approach the game", previewed Ronaldo, when trying to anticipate this Wednesday's game. Regarding Bayern Munich's biggest threats, the Portuguese player had no problems in putting names on them. Cristiano Ronaldo: "Essentially, we'll be worried about Bayern's attacking players. Mario Gómez, because he's their main forward and one of the UEFA Champions League top goal scorers. There's also Franck Ribéry and Arjen Robben who are very dangerous players to play against. I have no doubts that they are truly strong in the attack, but they are also also good in the other sectors. We'll have to keep an eye at their attacking players, because those will be the ones that will try to make the difference this Wednesday", alerted Ronaldo, perfectly aware of the true value this Bayern Munich's attacking force holds. Before this Wednesday clash between Real Madrid and Bayern Munich in the Santiago Bernabéu, Barcelona will also collide with Chelsea in the Camp Nou. In Cristiano Ronaldo's mind, there's only room for thinking about Bayern, at least at this point. Ronaldo: "I hope Real Madrid can be on the final and it doesn't matter if it's against Barcelona or Chelsea. What's impotant is that we manage to get through... We know how meaningful it will be to book a presence on the UEFA Champions League final, not only to all our players, but also to Madrid and all our fans around the World. That's one of the reasons why I am so thrilled to have the opportunity to play in this game against Bayern", said the Real Madrid forward, revealing he's a bit anxious about this Wednesday's match. Regarding what the future holds for him, the Portuguese superstar seems to have his ideas pretty clear at this stage. 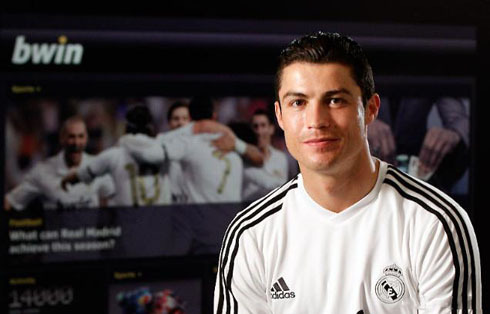 Ronaldo: "I'm very happy at the club. This is my third season in Real Madrid and I always try to do my best when I put this jersey on. Things have been going the way I want and hopefully, it will remain being like that for a long time." Before ending this interview with bwin.com, the Real Madrid forward made a note on how the fact that he doesn't change his preparation and usual training routines, no matter what opponent is on the list. Cristiano Ronaldo: "Regardless of who we face, I do everything the same way. The adrenaline might be slightly higher for certain games, simply because of the difficulty level of the game itself, but I always think about winning, no matter who the opponent is", concluded CR7. Real Madrid next game is against Bayern Munich, for the UEFA Champions League, this next Wednesday (25-04-2012). You can watch Juventus live stream, Real Madrid vs Bayern Munich, Barcelona vs Chelsea, Athletic Bilbao vs Sporting and Valencia vs Atletico Madrid, all from our football live streams section. Cristiano Ronaldo will most likely be on the line-up, when Real Madrid gets visited by Bayern Munich, for the 2nd leg of the UEFA Champions League.